Syrian government denies UN report saying it was behind attack in Khan Sheikhun, insists it does not use chemical weapons. Syria on Friday denied a UN report which says it was behind a sarin gas attack in April, saying the government does not use chemical weapons against its people, AFP reported. The United Nations report by war crimes investigators said they had evidence Syrian government forces were behind the April 4 chemical attack on Khan Sheikhun in which dozens were killed from sarin gas. On Friday, in a letter to UN headquarters in Geneva, quoted by the official SANA news agency, the Damascus government denied the claim and said, "Syria has not and will not use toxic gases against its people because it does not have them." Syria also accused the commission of "politicizing" its work. This is not the first time that Syria's government has denied involvement in chemical attacks. 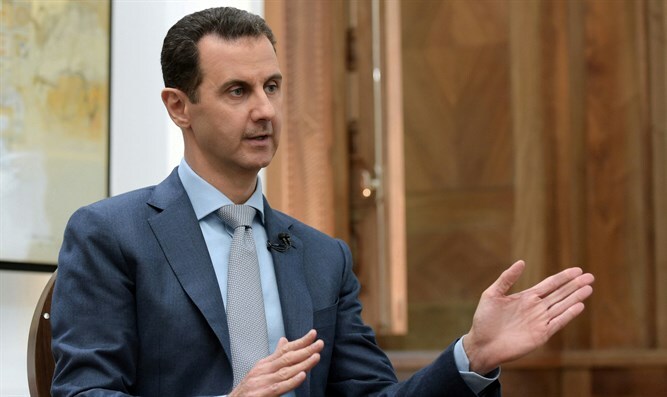 Shortly after the Khan Sheikhun attack, Syrian President Bashar Al-Assad claimed the attack was fabricated by the United States. The Organization for the Prohibition of Chemical Weapons (OPCW) has in the past determined that civilians in Syria may have been exposed to chemicals even after the Syrian government agreed to a 2013 deal, brokered by the U.S. and Russia, to surrender its chemical weapons. The latest UN report came after a fact-finding mission by the UN's chemical watchdog, the Organization for the Prohibition of Chemical Weapons, concluded earlier this year that sarin was used in the Khan Sheikhun attack, but did not assign blame.